As we live more of our lives online and entrust personal information to the cloud, we need to be much more aware and proactive about protecting ourselves. Are you safe from hackers? Not without taking precautions. Your identity can be stolen, your company's intellectual property can be copied and sold, and even hacks that just a few years ago sounded like science fiction will soon be possible: vehicle systems can already be hacked, and our power grid can be manipulated or sabotaged by terrorists. But knowledge is power. In this easy-to-read, fascinating and fully illustrated book, you learn how hackers make money, and what they target - along with concrete, hands-on hints for fighting back, whether you’re a concerned parent or a top executive. With all the surrounding threats, what better person to prepare the public, than a team of internationally known cybersecurity experts? Nick Selby is a police detective specializing in sharing intelligence and busting cybercriminals. He knows how these crimes happen, who does them, and how to make your life safer. In The Cyber Attack Survival Manual he and a veritable brain trust of experts from the world of intelligence, digital currency, vehicle-hacking, and sophisticated crimeware, share the best techniques for everyone. Everyday security: How to keep your identity from being stolen, protect your kids, protect your cards and much more. Big Stories: Silk Road, Ashley Madison, FBI vs. Apple, WikiLeaks, BitCoins, and what they mean to individuals and society at large. Global issues: the NSA, how hackers can crash your car, and is China really planning to crash Google? 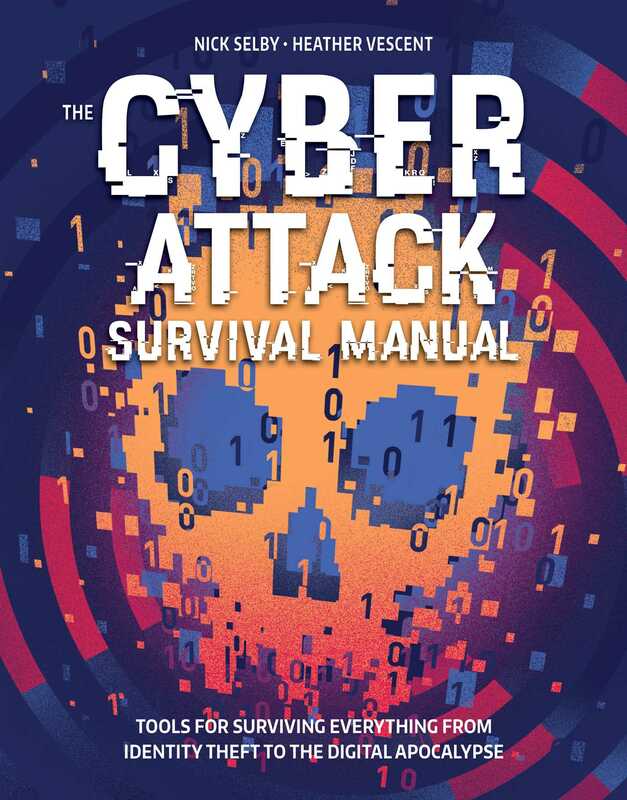 Crucial to surviving the worst the Internet can throw at you, The Cyber Attack Survival Manual is the must-have book of the 21st century. Think you don’t need this book because, “I have nothing to hide”? Selby and Vescent, along with Eric Olson, Moeed Siddiui, and John Bear, show you why you’re wrong (everyone now has something to hide) - and how lack of security can endanger your finances, your safety, and your reputation. DIGITAL SAFEKEEPING In the future, we won’t get to simply stash our cash in a safe or under a mattress. New forms of finance mean new protocols for keeping your money safe. of unauthorized transfers or transactions. Stay Secure with a Selfie Banks are motivated to use secure systems. Passwords can be difficult to enter on a mobile device, so banks have other secure authentication systems options: your fingerprint, a PIN, or facial (or even voice) recognition. The secure selfie is even hacker proof—you must blink or make a facial gesture that you can’t duplicate with a photograph. Be Safer with Biometrics Biometric verification has been thought of as the great fail-safe. The idea is that it’s near impossible to replicate someone’s fingerprint or iris or retina, although hackers (and Hollywood) have shown ways to duplicate a fingerprint. Unlike a password reset, it’s not that easy to get a new fingertip or eye. There are, however, security combinations that use hashed biometric data for three-factor (adding a biometric to the password and token) or even four-factor identity verification involving a second biometric. The more factors that are required for a transaction, the harder it is for a thief to steal or replicate them. Practice Credit Control Use multiple credit accounts. The first is for automatic monthly payments; the second (with a low limit) for spontaneous online purchases and the like (this number can be virtual, or even single use, so you have to get new ones each time you want to use the account); and a third for physical shopping, with a slightly higher credit limit. Monitor your credit score. You’ll know if there is a change in your score and be empowered to fix it. Check your bank accounts on a regular basis via a dashboard or phone app, and set up notification for certain transactions and amounts. Tell your bank or credit company when you are traveling so it will allow your purchases. Know your bank’s customer service numbers and how to stop payments or authorize a charge on your mobile app.